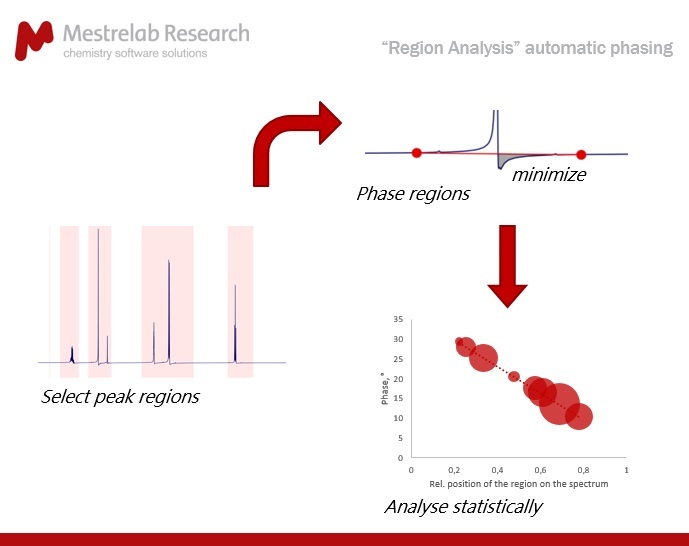 After our successful previous webinar series we started in 2017 with two of our colleagues at Mestrelab, Dr. Mike Bernstein and Dr. Vadim Zorin, presenting a new automatic phase correction algorithm integrated in Mnova NMR analysis software. This webinar took place on January 12, 2017. Tremendous recent progress in NMR continues to drive a demand for fully automated processing and analysis capabilities.1 In some cases, these are a response to increased levels of automated data acquisition, but there is also an increasing need for non-expert NMR users interested in turnkey or “push-button” solutions to get simple answers to their specific chemical problem. Unassisted processing and analysis is being applied to analyses of ever increasing complexity, to the point where an automated solution should be developed for every new functionality. But successful, robust automation of the most basic processing tasks can be surprisingly difficult. Some examples of such applications and their importance will be discussed. 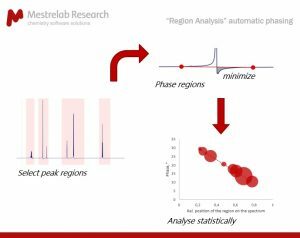 Whilst the majority of NMR processing steps can be easily automated, the most challenging operations are clearly phase and baseline corrections. These steps continue to stubbornly pose challenges despite considerable efforts. Over the years, we have implemented in MNova several automatic phase correction algorithms, and a brief overview of the existing methods will be presented. While these techniques can provide reasonable automatic phasing in specific cases, demand for a robust autophasing algorithm persists. 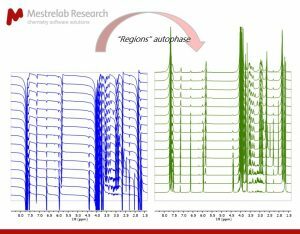 We recently introduced a new 1D NMR autophasing algorithm, “regions analysis”, which is capable of efficiently handling a wide variety of spectra with features that can cause difficulty for automated algorithms. These are mainly baseline imperfections, low SNR, peaks with different signs, or distorted lineshapes. Details of the algorithm will be discussed. We will present practical examples that illustrate the wide performance capability of this new automated capability. 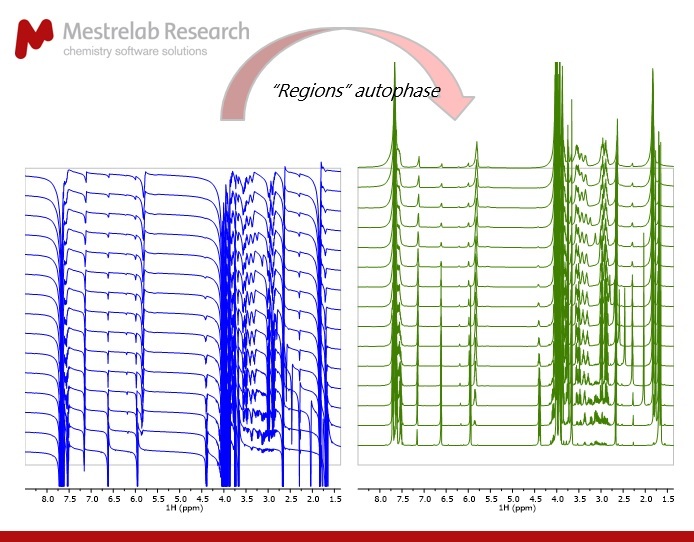 The robust, automatic processing of NMR spectra is therefore a step closer to realization. Perez, M. (2016) Autonomous driving in NMR. Magn. Reson. Chem., doi: 10.1002/mrc.4546. Dr Mike Bernstein is the Vice President of R&D at Mestrelab. Prior to joining the company some 5 years ago, he worked in large Pharma, with a focus on NMR provision for drug discovery and development. His post graduate training was in NMR (Physical Organic Chemistry) at the University of British Columbia. His interests are with all aspects of NMR data processing and analysis, but specially where they relate to automation and quantitation. He also maintains a strong interest in information extraction from reaction monitoring data. Dr Vadim Zorin during his career held several NMR-related academic and industrial positions, most recently working as an NMR application scientist at Agilent Technologies and spectroscopy lab supervisor at ExxonMobil Chemical. Vadim’s professional interests include various aspects of NMR, NMR processing and software. Vadim is an author of freely available processing and visualization software “GSim”, used by several solid-state NMR groups worldwide. Since joining Mestrelab in March 2016, Vadim is working on a number of NMR-related projects as a senior software developer. Stay tuned as we will have more interesting webinars coming up very soon!